1. First make the filling. In a large pan, melt half the butter and sweat the garlic with most of the thyme. Add the chesnuts to the pan. As the butter foams, the chestnuts will start to caramelise. 2. Add the mushrooms and turn the heat up to give them some good colour. When the mushrooms have softened, add the masala and reduce by half. Add the spinach and sweat down. By now you should have a thick buttery mushroom filling. Remove from the heat, season, add the truffle oil (optional) and a squeeze of lemon juice to freshen. Finally, add the goat’s cheese and set aside to chill. 4. In the middle of each rectangle, place a quarter, or a fat sausage-sized, portion of the chilled filling. Roll the pastry up lengthways and squeeze the ends to form a Christmas cracker. Place on a large baking tray, brush with the beaten egg and sprinkle on the remaining thyme. Bake for 25 minutes or until golden. 5. Whilst the strudel is baking, make the mustard sauce. In a saucepan, sweat the shallot in butter. After 2-3 minutes, add the white wine and reduce quickly by half. Pour in the cream and mustards, then bring to the boil. Stir constantly until the sauce has thickened to the consistency of warm custard. Remove from the heat and season. 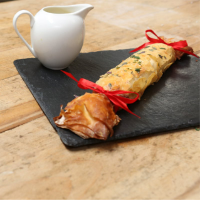 Stir in the chopped tarragon and serve with the Christmas crackers. This recipe was first published in Fri Nov 22 16:44:00 GMT 2013.